Sonic Forces is not a tough game. Are you over six? Can you stay sober for four hours? Do you have opposable thumbs? Well, you’ll only struggle with a handful of levels, the odd boss battle and one annoyingly unfair fight right at the end. All the same, there are a few things you might want to know to make things even easier, or that will help you get the most out of Sonic’s latest adventure. 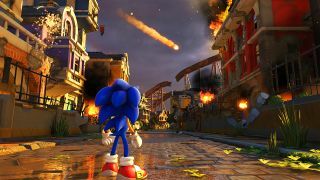 Simply blundering through the game will net you a whole ton of rings, but Sonic Forces’ levels – particularly its 2D-focused levels – always have additional routes and hidden caches of treasure you can grab just by dropping down or jumping up to a lower platform or by using the right ability at the right time. Both Modern Sonic and your Avatar have a homing spin ability. Jump in the air, watch for a green crosshair on an enemy, then press Jump again to speed towards and smack the baddie. This isn’t just good for bashing your foes, however, but also for making it through obstacles or across gaps. If you’re stuck or keep on falling, look for an enemy to home in on. The two Sonics you’ll play during the game have different capabilities. Where Modern Sonic has the homing move and double jump to rely on, Classic Sonic only gets the single jump and has to bounce on enemies like he did in his nineties heyday. This can be a bad thing to forget when you’re trying to jump across a large gap or leap towards patrolling nasties. Smashing through certain objects will give you a power to activate for a limited time, like the ability to chain jumps vertically or blast through enemies and speed upwards at a faster pace. These are put there to use, either to reach hidden areas or – in a few tough sequences – as a means to escape impending doom. If you hear, say, ‘Lightning’ don’t ignore it. Most of the avatar stuff is cosmetic, but the different base avatars – cat, hedgehog, wolf, bear, etc. – move slightly differently and have different secondary abilities. The cat, for example, holds onto one ring after being damaged, giving you an extra barrier against certain death. The rabbit is invincible for longer after damage, while the bird has a better double-jump. If you know you’re prone to blunder into danger or you struggle with jumping, pick an avatar to cover for your weakness. Similarly, the Wispon you pick for your avatar can have a real impact on the game. Each one has its uses, but some like Lightning, Asteroid and Hover are particularly handy, with the last one occasionally saving your bacon when you fall. Some are melee-only, which can cause you problems in certain levels, while the Drill is hugely powerful but slow to charge. If you do struggle with a level, try quitting out and changing Wispon, then heading back in. If you haven’t played Sonic for a while, you may have forgotten that you drown underwater. Look for air bubbles to refresh Sonic’s air supply. Occasionally it’s tempting to wrestle more control away from the game. Don’t bother. If the camera is pushing you in one direction don’t try to fight it; you’ll just fly off the rail, fall out of the chute or miss a crucial jump and fall between the scenery. Let the game guide you and keep spamming the jump button like your life depends on it (Sonic’s does). Sonic Forces has a new enemy, the fiendish Infinite, who keeps hurling out constructions made of weird, crackly red blocks. These damage you and then distort Sonic’s reality, inevitably leading to more, possibly fatal harm. Dodge those things, especially in the later boss battles. Sonic Forces’ bosses aren’t that bad, but three practices will help you beat them faster. Firstly, watch and learn before you try and jump them. Work out their attack patterns and look for when they’re vulnerable; the green crosshair is a surefire giveaway. Some bosses hurl things at you which you can then hurl cheerfully right back. Do so by jumping against them. Finally, don’t grab all the rings in the boss stage at once. Get hit and you might lose them all, so keep some in reserve to grab and give you a little protection. Sega released a great Sonic game this year, but Sonic Forces isn’t it. Sonic Mania might have defiantly old-school visuals and a sometimes intimidating difficulty level, but it’s smarter, more inventive and more satisfying than Sonic Forces ever manages to be.